I spent the last four days in Austin, Texas where I consumed a shockingly small amount of Tex-Mex or barbecue. I did, however, consume a large amount of Shiner Bock which, as far as I can tell, may be the only beer served in Texas. Luckily it's pretty good. 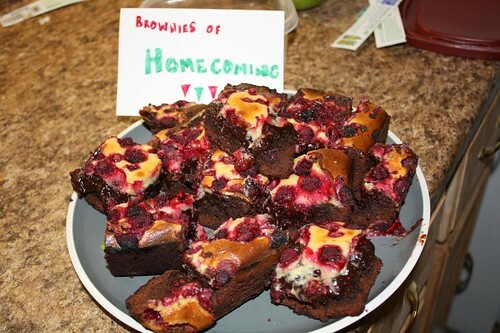 I returned home to brownies (baked for me by Jen) and a giant bowl of homemade risotto. After only four days of eating away from home and I ate both of these items as if I'd been trapped in a well for the better part of a month. It was great to be back in the kitchen, even though our inventory has dwindled substantially in the week since I last went shopping. For lunch I was forced to eat up the remaining turkey curry from the freezer, something which was actually very good but I ate with a great deal of reluctance. For salad I didn't have a lot of options. 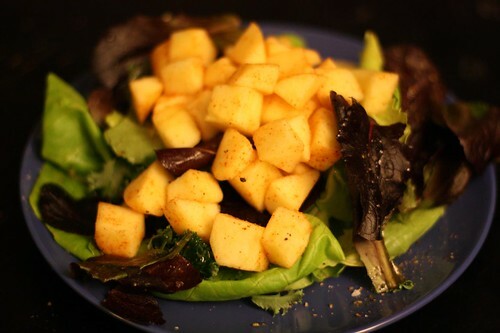 I threw together this salad with every last remaining bit of greenery in the fridge, some apples, lime juice, cumin, smoked paprika, olive oil, salt, and pepper. This salad could have probably benefited from some other things. However, this was all I had to work with. 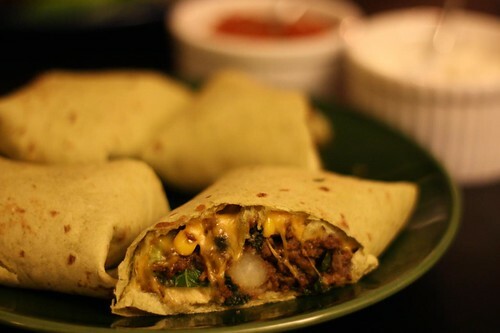 I used up some frozen ground beef and frozen tortillas to make these burritos with chopped garlic, onion, potato, ground beef, kale, smoked paprika, hot sauce, thyme, oregano, chili powder, and cumin. I had intended to make quesadillas but Jen said that burritos would be better. It seems very obvious now. Who puts ground beef in a quesadilla anyway? An idiot, that's who! 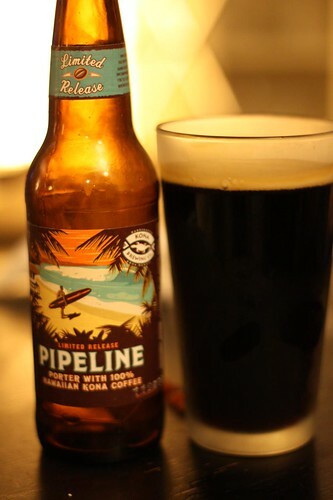 After dinner I had this Pipeline Porter from Kona Brewing Company in Hawaii. This is the second coffee porter I've had and I think that maybe it's just not my thing. They are two flavors that I enjoy separately just not together. I also enjoy pickles and I enjoy ice cream just not together. 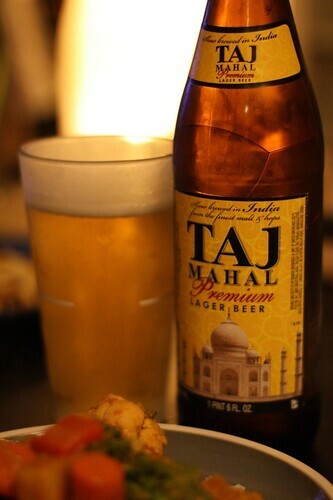 Tonight I had hoped to continue the tastes of the British Empire series from last night. Instead I just ended up using up some leftovers from the fridge. 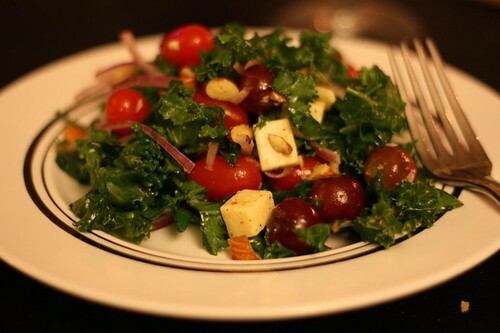 For salad I tossed together some kale along with grapes, Parrano cheese, sliced almonds, grape tomatoes, and sliced red onion. I dressed this with a little lemon juice, olive oil, salt, and pepper. It was a very tasty salad and stood a good chance of being far better than the main course for the night's dinner. I had the task of using up the remaining lasagna leftovers from last week. 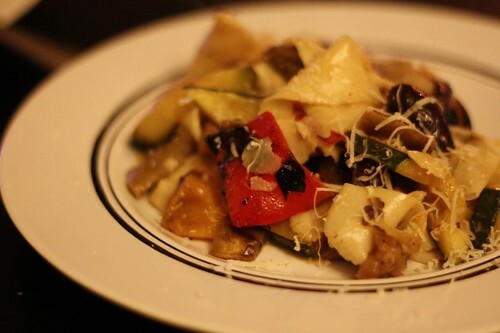 What I had leftover was a good amount of roasted vegetables and some fresh pasta sheets. I decided to brown a little garlic in olive oil and butter then chop up the roasted zucchini, eggplant, yellow, and red peppers. There were also some kalamata olives in the fridge that I tossed in the pan with a little white wine and Parmigiano-Reggiano. 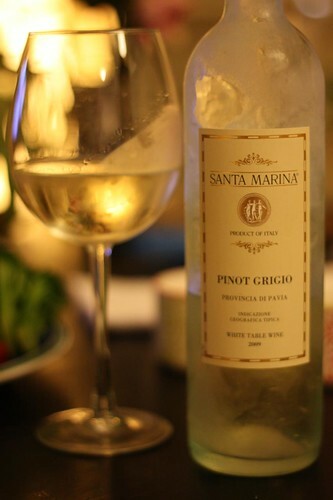 A nice crispy white wine would have gone nicely with tonight's dinner. I made Jen a white wine spritzer with the remaining wine and chose, myself, to opt for beer. 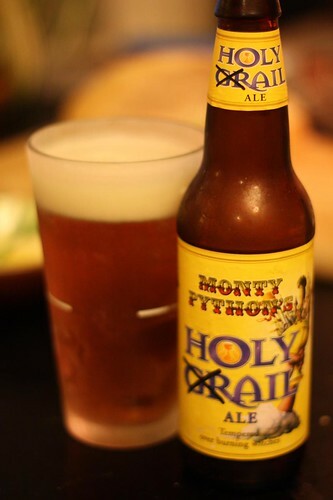 I had this Monty Python's Holy Grail Ale from Black Sheep Brewery. 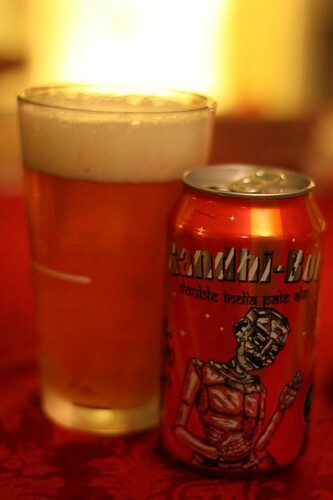 It was a tasty ale that had a wheaty, bready taste to it with a strong finish of gimmicky marketing. Jolly good, right ho, pip pip, and Bob's your uncle! It's time to cook some foods of the British Empire! Well, parts of the British Empire. Okay, mostly just the part that is India. Or, even more specifically, the part that is Indian restaurants in Britain. Ever since seeing the episode of Oz & James Drink to Britain where James makes his own Gin I have been craving a gin and tonic. Luckily we have had the same bottle of Bombay Sapphire that I got Jen for Christmas in 2003. For tonic water I picked up some Q Tonic. 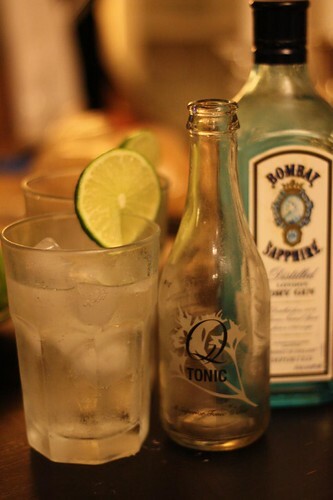 Q Tonic is like regular tonic water except it's made with natural flavoring and it is phenomenally expensive. If we drank more gin and tonics this may have been prohibitive. However, given that we've had the same bottle of gin for the better part of a decade it's okay to splurge every once in a while. 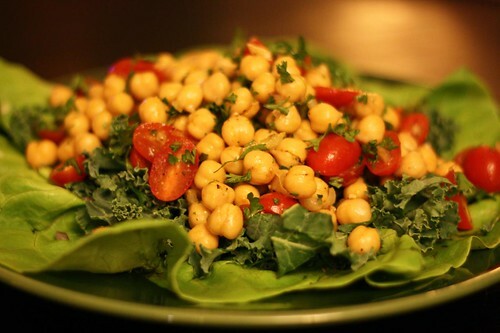 I made a salad of bibb lettuce, kale, chickpeas, olive oil, curry powder, red onion, grape tomato, parsley, and a dash of hot sauce. If the bibb lettuce and the plate of this salad look similar to the base of the salad we had with last night's fondue dinner that is merely a coincidence. Jen mentioned during the salad that she doesn't think that she likes curry powder. This is news to me. Cue my father-in-law who will surely mention that my mother-in-law does things like this all the time. 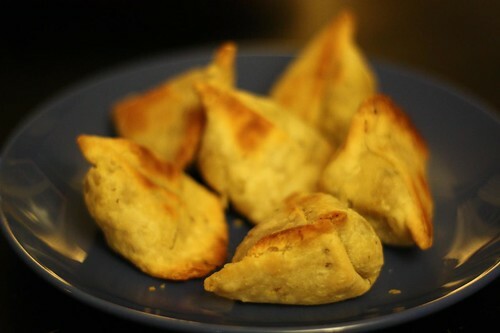 Is it okay to make frozen samosas? Because that is exactly what I did. 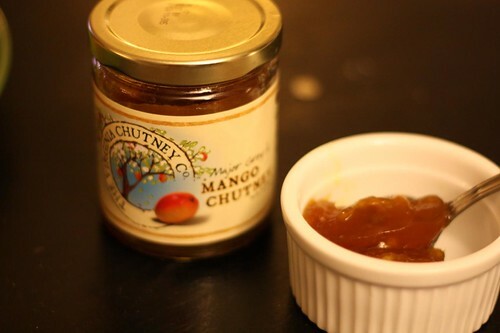 Along with the samosas and the naan bread I served some mango chutney from The Virginia Chutney Co. It's Major Grey's chutney which is apparently a type of chutney much in the way that Earl Grey is a type of tea. Except, unlike their crummy tea, I rather like their chutney. The Greys have their grubby 19th century mitts in everything! 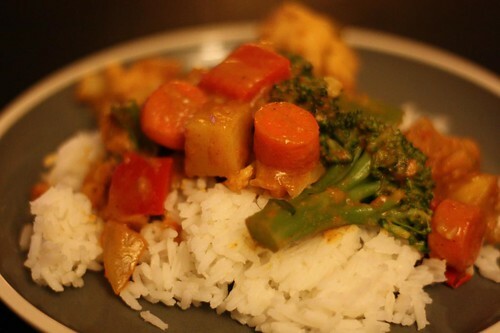 For the main course I used some onion, carrot, cauliflower, broccoli, potato, red pepper, and okra to make this vegetable korma. Stawski Distributing home of Stawski beer: "The only TRUE Polish beer." Huh? I had two drinks this evening! It's okay though because I started with gin. You know what they say, "Liquor before beer, you're in the clear." They also say, "If you only have two drinks you're probably fine with any sort of combination. For dessert we watched Monty Python's the Life of Brian. Both of us for the first time (go figure). What could be more British than that. Now I finally know what all those super-annoying nerds in high school and college were referencing all the time. Some nights I'm just lazy. Also some nights I have stuff that is already prepared and I am cheap. Cheap and lazy makes for some innovative meals. Let's take a look at what that yielded tonight, shall we? To keep with the laziness theme I bought some salsa. However, I made guacamole. That's a perfect equalization of laziness versus industrialness (assuming that was a real word) as far as I'm concerned. 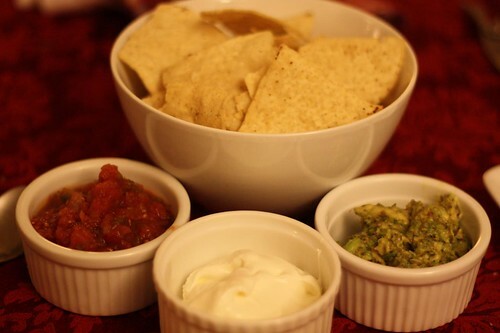 However, I did not make the tortilla chips nor did I make the sour cream. So much for all that industrialness. (Still not a real word). 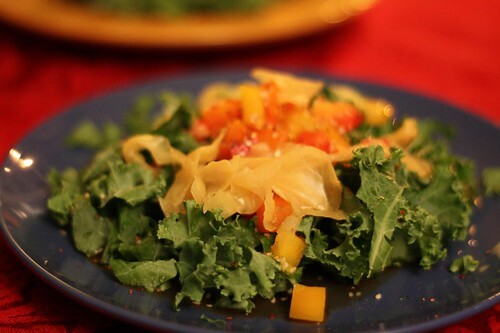 For a salad I tore up some kale and dressed it with a little lime juice, tequila, olive oil, chili powder, smoked paprika, and cumin. Then I added in some sliced red onion and topped it off with goat cheese. Jen was not a fan of this salad. Indeed it was a bit too acidic. I think the lime that I used (which, by rights, should have moved to Florida weeks ago to live in a retirement community with other fruits past their prime). So I'll blame the fruit. It's always easy to blame the fruit. 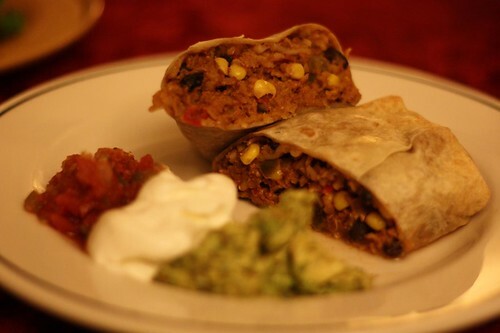 The main course was a burrito that I did not make. A man (or woman) named Red (presumably) made it. It's from Red's All Natural. There's a quote on the wrapper from The Burrito Baron which states: "The only way to make a Red's Burrito better is to saute it in unicorn tears." I'm not entirely sure if the Burrito Baron intends this to be a compliment or a criticism. Maybe that's only because I have never tasted unicorn tears. I'm not sure if unicorn tears were ever a theme ingredient on Iron Chef. I know that shark's fin and swallow's nest were and I assume that those two ingredients are likely more expensive (and flavorless). For beer I enjoyed this dark English ale from Wychwood Berewery. 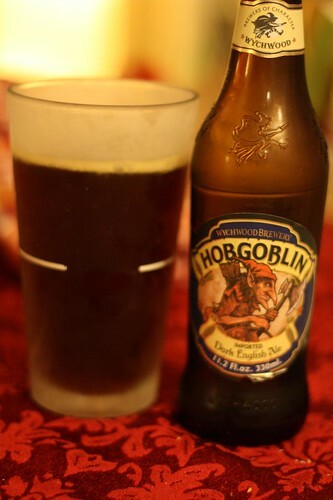 It was a very tasty ale that tasted like hobgoblin tears and molasses. But mostly molasses. Don't get me wrong, the battle axe wielding, quiver full of arrows having hobgoblin on the label of this beer was enough to pique my interest. However, the real reason I bought it was because of the Spider-Man villain. If Marvel ever releases a line of beers based on second or third tier villains from their comic books their success would be debatable but they would have a very stable source of revenue from one sad man (me). And there would be one angry woman (Jen). I used a lot of parentheticals in this entry (don't you think?). This week seems to be lined up with extremely basic and kind of generic-looking Americanized ethnic foods. 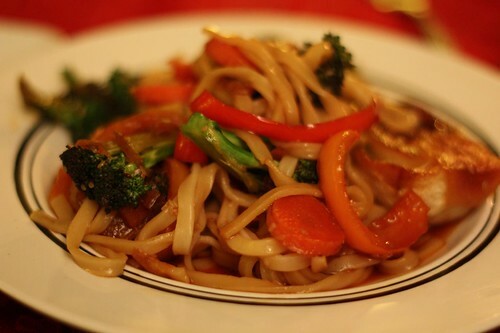 I'm not really sure why it lined up that way but the sequence of dinners this week allows for maximum usage of fresh vegetables, a break from meats, and the opportunity to use up many things that have been clogging up our freezer, pantry, and fridge. Tonight's ethnicity? Mama mia! It's a-Italian. Bella! Okay, the salad was not actually Italian at all. In fact I'm not sure what it was. I guess I would refer to it as faux New England cuisine. I wasn't breaking any new ground with this one. 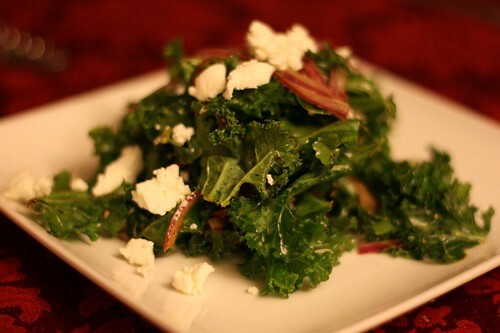 The only thing unusual about it was that it was made with kale instead of mesclun mix. 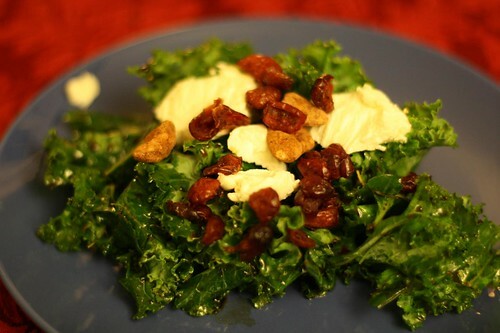 I put some goat cheese, cranberries, and candied pecans on top of the kale with balsamic vinegar and olive oil. The flavor combination is not exactly going to win me a James Beard award but it's a classic for a reason. 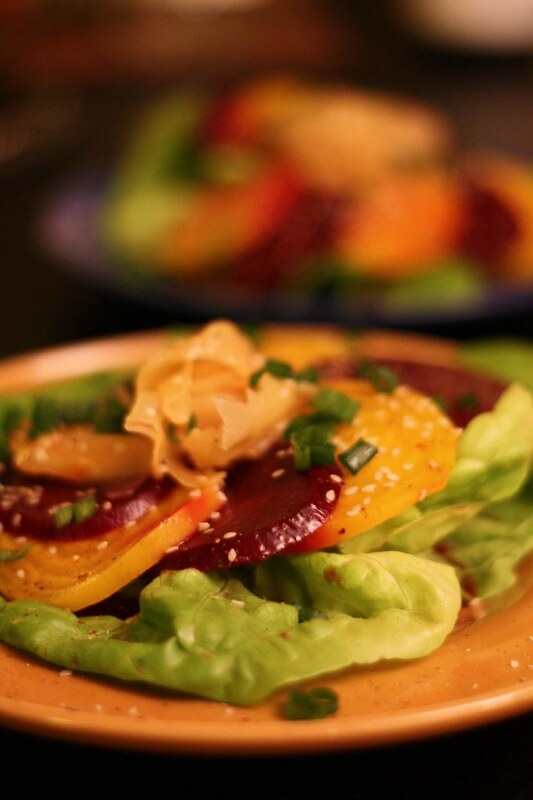 It's a great salad for a nice fall night, or an unseasonably warm winter night. The only problem is that I think the nuts are a bit stale. Actually quite a lot stale. In fact, I threw away the remainder of the pecans so that they will not taint another salad. 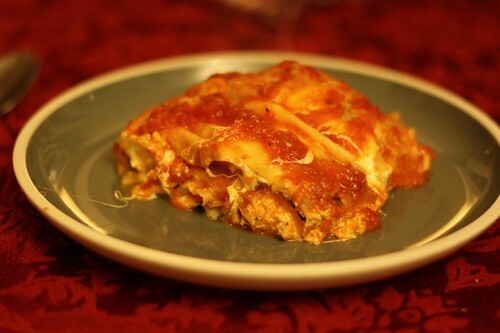 I had leftover pasta dough from our rabbit pasta the other night so I used it to make this lasagna. I sliced some zucchini and eggplant and roasted them lightly in the oven. Then I grilled some red, yellow, and orange peppers on the burners on the stove. It's kind of a disgusting technique but one that I find works fairly well. After that was done I layered the pasta sheets with tomato sauce, fresh mozzarella, ricotta, sliced zucchini, sliced eggplant, and sliced "grilled" peppers. It didn't photograph in a way that you could discern any ingredients other than pasta sheets and tomato sauce but the result was quite nice. I really wanted to pair this lasagna up with the perfect beer this evening. 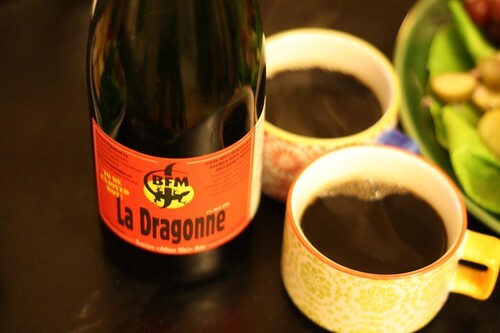 I looked around and the best beer I could find was called red wine. I didn't really feel like having red wine so instead I opted for Belgian beer. 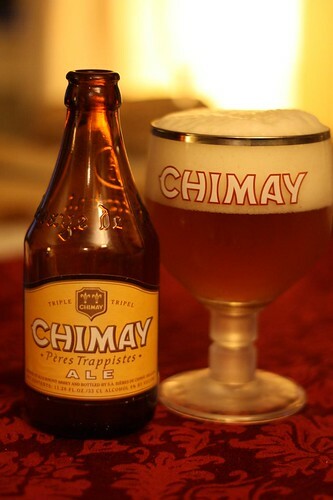 When I feel I've earned it I give myself a Chimay. That sounds like it could be a great advertising line. Hey, Chimay people, email me if you need my address to send me a check for coming up with that amazing new English language slogan for you. 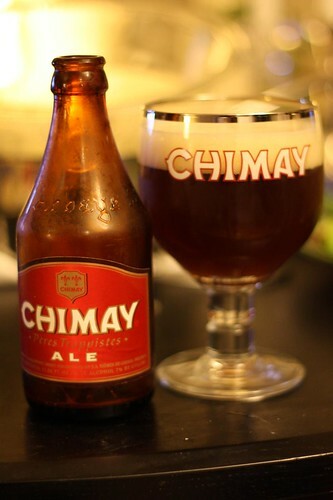 Generally I always want to drink Chimay but I don't because that would be too boring to write about every night. Instead I choose this to be a sort of reward for when I think I've earned it. I didn't really have any real reason to drink the Chimay tonight other than that I feel like I may be coming down with a sore throat. Therefore I wanted to have this in case I woke up tomorrow and wouldn't be able to enjoy a beer. Last time I had the red label, tonight I had the yellowish-brown label. I really don't know what the difference is between the two. A quick look at the Bières de Chimay link on Wikipedia reveals an explanation that doesn't seem to match up with the beers I have at all. It claims that the "golden" label has 4.8% alcohol but the label on my beer reads 8%. If you match that up it seem that I have the white label Chimay. It doesn't look white to me. Perhaps they've changed the coloring system. While I enjoy the different colored labels I may wish to recommend that Chimay come up with a different name for each beer. The yellowish-brown label says "Tripel" on it so it must be the white label they're referring to. Perhaps I should have had whiskey instead. It's simpler and would probably work better on my throat. Tonight was a real race against the clock. 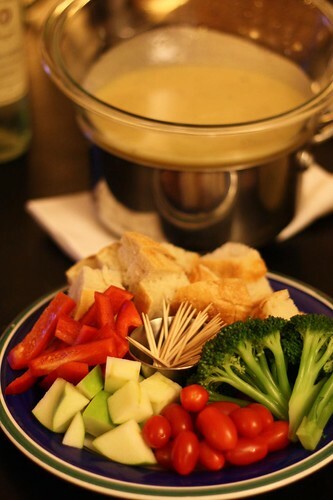 Not only did I have elaborate dinner plans but Jen was home uncommonly early! This gave me a mere 20 minutes to prepare for dinner before she returned home -- just enough time to do the dishes. 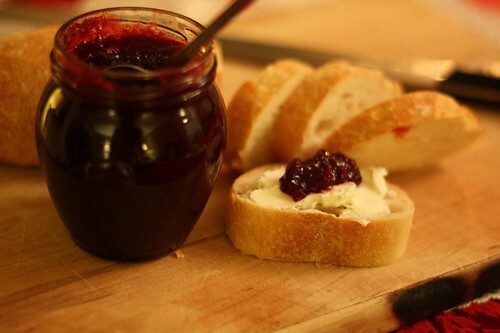 To satiate us until the main course I put out a baguette with some goat cheese and sour cherry jam. This tasted great but a little too much like cheesecake so it seemed like we were having dessert first. How decadent! It felt like 3 AM at 6151 Richmond Street. 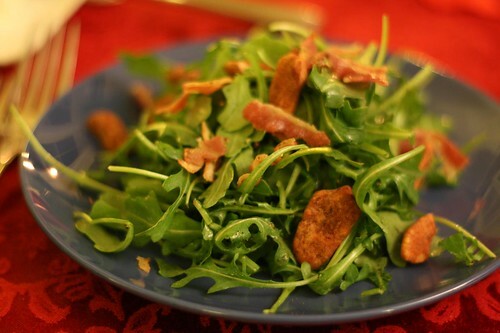 For a salad I made this little number with arugula, olive oil, lemon juice, salt, pepper, crispy pancetta, and candied pecans. It was only as I wrote this that I realized I had not put the sliced Pinova apple on top as I'd originally intended. For some reason when I forget to put an ingredient into a dish it fills me with an unholy rage. For a main course I took the same pan I'd rendered the pancetta in and seared a half rack of New Zealand lamb, and some sea scallops. Then I removed all and threw in some garlic, finely chopped onion, and Great Northern Beans. Then I threw in some chopped parsley and the remainder of the fresh baby arugula. I was a bit worried about all of this being redundant but Jen told me it was "thoughtful." I was thinking "lazy" but I'll go with her assessment. I feel like surf and turf has long been locked into either beef and shrimp or beef and lobster. 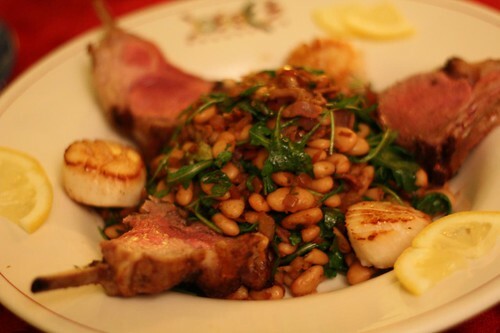 I just turned surf and turf on its ear by turning it into lamb and scallops. On its ear I tell you! 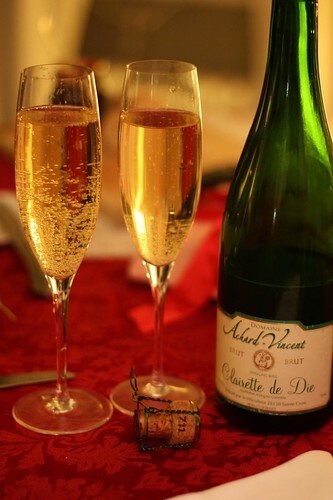 To accompany our dinner we enjoyed some Clairette de Die that Jen picked up recently. She wished to recreate the time we enjoyed this beverage while driving through the Vercours in France. Unfortunately we didn't get the fine packaging we'd observed when we were there. Meoooooooooow! 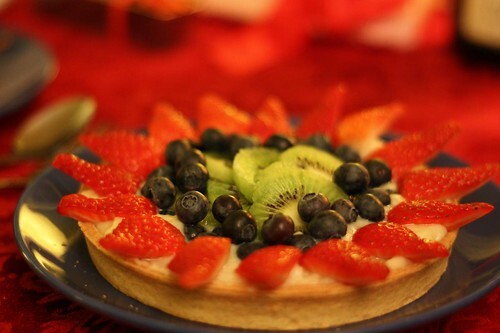 For dessert I made this fruit tart with the remaining pastry cream from the "Japanese" dessert I made the other night. After I threw this together I realized it reminded me of something. At first I couldn't remember what it is then it hit me! Oh my God! 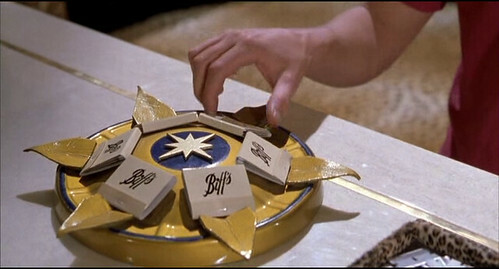 It's Biff's ashtray from Back to the Future II! 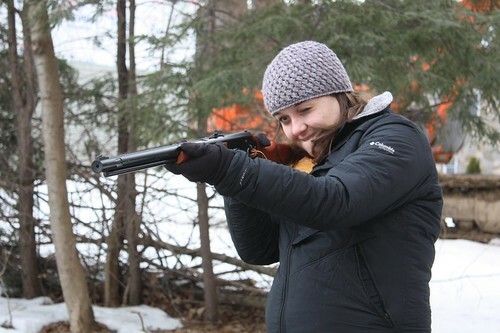 For the rest of the night I was afraid that Jen was going to pull out a revolver and tell me that she warned that a "crazy, wild-eyed scientist, or her husband would come asking questions." So far she hasn't tried to shoot me yet. I'm sleeping with one eye opened tonight though. Jen has been dreading this day for a while now. It was the day where we would be forced to utilize the leftovers from our braised rabbit earlier in the week. Jen hates leftovers. It's my job to be clever, and sometimes cheat and lie, in order to get her past the fact that she is eating leftovers. 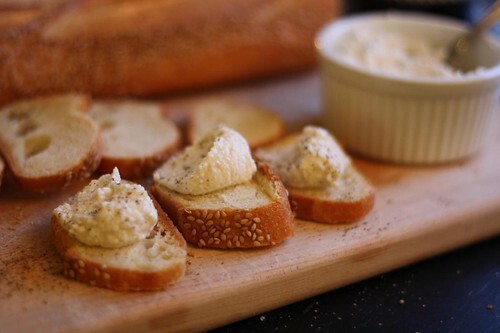 I started my offering to make this ricotta spread for the semolina baguette we picked up this afternoon at Tarry Market. I intended to make it with lemon and honey but we had no lemon. Jen suggested using grapefruit which I thought was a crazy idea but I did it anyway and it was fantastic. All we used was ricotta, honey, grapefruit juice, salt, pepper, and fresh rosemary (another of Jen's ideas). The result was far better than I would have imagined. 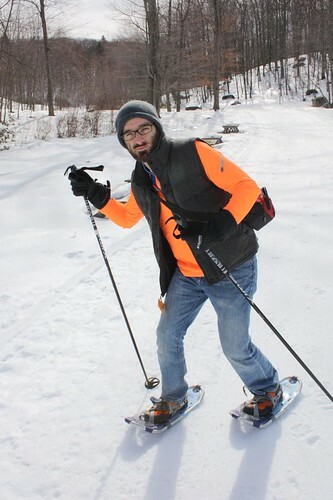 In fact I look forward to trying this again soon. We've been watching a lot of Oz & James's Big Wine Adventure the past few nights and this has caused me to crave wine more than normal. 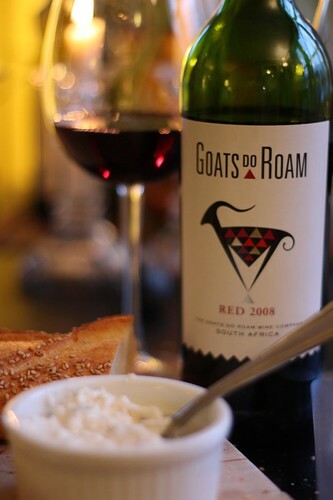 Since we'd enjoyed a Côtes du Rhône from M. Chapoutier (featured in an episode of Oz & James) for the first iteration of our rabbit, I opted to serve up this bastardized Côtes du Rhône -- Goats Do Roam -- for the bastardized rabbit dish we were preparing to make this evening. 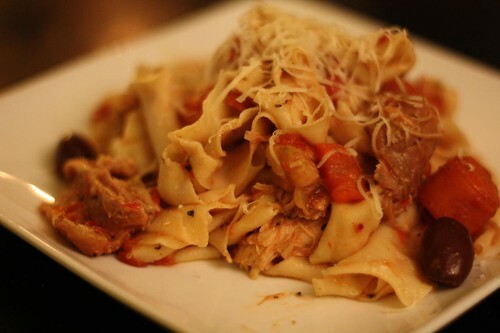 I had planned on turning the leftover braised rabbit into a pasta ragout much to Jen's dismay. While at the market Jen suggested using fresh pasta but instead of buying some I decided it would be more fun (and more of a mess) to make it ourselves. 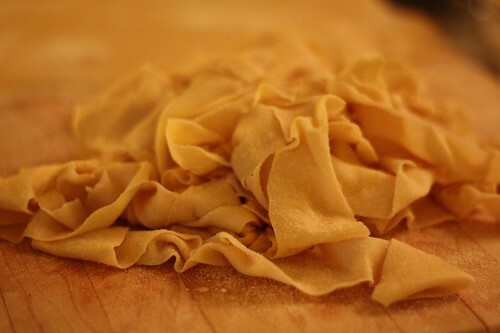 Jen helped me roll out these great sheets of pasta and I cut it into pappardelle, then added it to the remaining deboned rabbit stew and adding a little olive oil, butter, and Parmigiano-Reggiano. The good thing about ragout is that it is always far better than Jen is expecting because normally she dreads it for days beforehand. 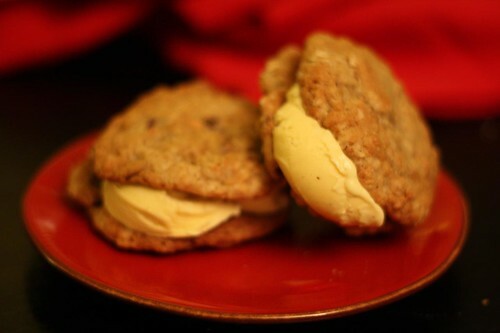 For dessert I took some of Jen's chocolate chip cookies and turned them into little ice cream sandwich cookies with some vanilla ice cream. It's hard to beat ice cream cookie sandwiches on a cold night with Oz & James's Big Wine Adventure playing in the background. Our only sadness in life is knowing that there is a very finite number of episodes before it is over. Don't complain to us about your trials. We have real problems. I don't know anything about Japanese cooking. Well, I guess I know a little. After all I have seen nearly every available episode of Iron Chef. So that means I'd like to think I'm something of a secret expert on the cuisine. What this actually means is that I'm more dangerous than anything else. 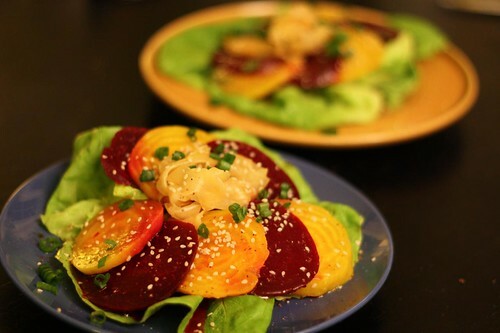 One thing that I know is that in over three hundred episodes of Iron Chef (the real Iron Chef, not the American version) they never once had beets as the theme ingredient. So I figured what better place to start with my Japanese dinner? 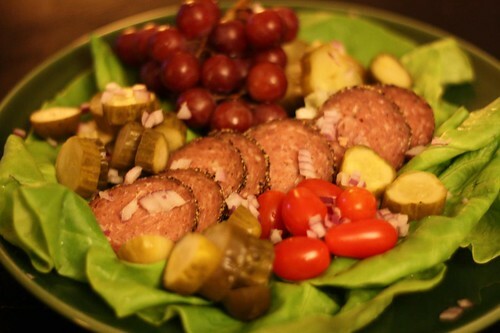 I made this salad with the leftover bibb lettuce and beets from last night. I dressed it with rice wine vinegar, sesame oil, and soy sauce and topped it with sesame seeds, sliced green onion, and pickled ginger. I got some nice beef short ribs at the local butcher shop the other day when I picked up my rabbit. I tried to look for a recipe from Katsuyo Kobayashi, a personal favorite in the realm of Japanese cooking. Unfortunately while she has about four hundred cookbooks there are few English versions available and the one Jen gave me for Christmas didn't have any beef short rib recipes. 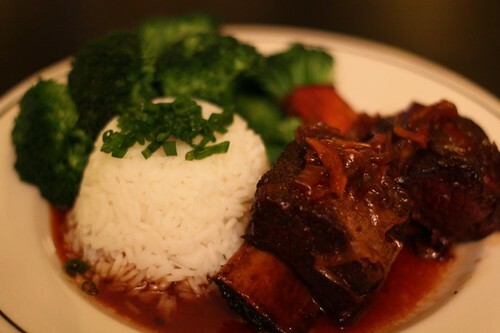 I did, however, stumble upon this recipe for Okinawan-style beef short ribs which looked very interesting. 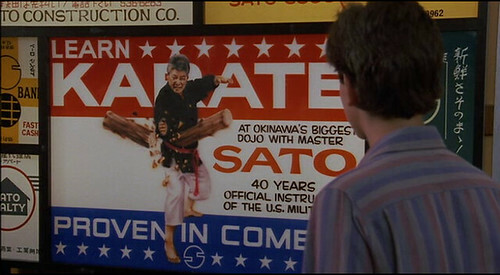 Since Mr. Miyagi is from Okinawa I figured I would give it a shot. 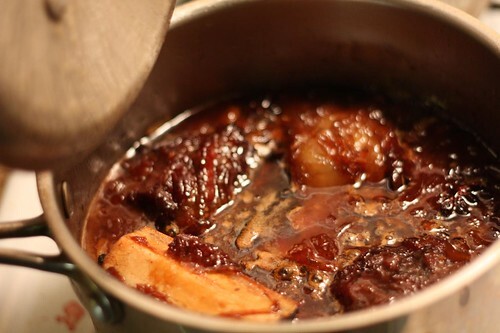 The only problem with the recipe was that it called for dashi to be made. After a few trips to local stores I was unable to find any kombu to make my dashi and I was running out of time before dinner and would have to resort to using up some more of my turkey stock from the freezer with some water added to it. I was reminded of the episode of Iron Chef where Takeshi Kajimoto, a master of seaweed broths, made a bunch of different broths in the abalone battle. It probably wouldn't hurt if I had a little more exposure to Japanese culture apart from Iron Chef and Dragon Ball Z.
I seared the ribs in a pan, added some garlic, ginger, and shallots, then added my stock, some mirin, soy sauce, maple syrup, and star anise, reducing the broth down while braising the ribs. I steamed some white rice and broccoli and served them both, fairly plain, as sides. With the thick, sweet, reduced sauce from the beef there was little reason to do anything else to the rice and broccoli. 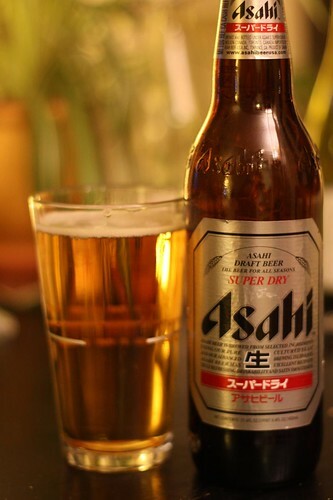 For beer I opened this big bottle of Asahi Super Dry to split with Jen. I then found out that Jen doesn't care for this particular beer so she only had half a glass. I'm the real winner in this scenario. For dessert I decided to use the leftover puff pastry from last night to make my own take on traditional Japanese shu cream. 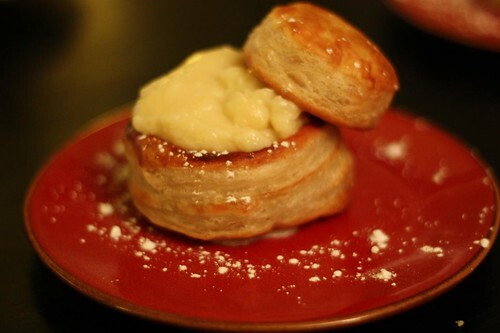 Traditionally shu cream is like a little cream puff but filled more with a custard-like substance than cream. My version was a little bowl I made which I filled with a quick custard I made (like an ordinary pastry cream) and I dusted it with powdered sugar. It's kind of a French-style version of it which is fitting because French is the only style of cooking they taught me in culinary school. In fact if anyone from my alma mater reads this they will probably nullify my diploma. I'm not even supposed to know about Japanese cooking or even Japan for that matter. In fact I shouldn't be telling you any of this. I've already said too much.